Please review the links below for more information about the Connected Learner Program at Arapahoe High School. When you complete the Online Registration this summer you will be asked to specify whether your student is bringing their own laptop or wants to use one of our chromebooks. Please note that the verbiage might be a little bit confusing as AHS is the only school that is still allowing you to bring your own device. 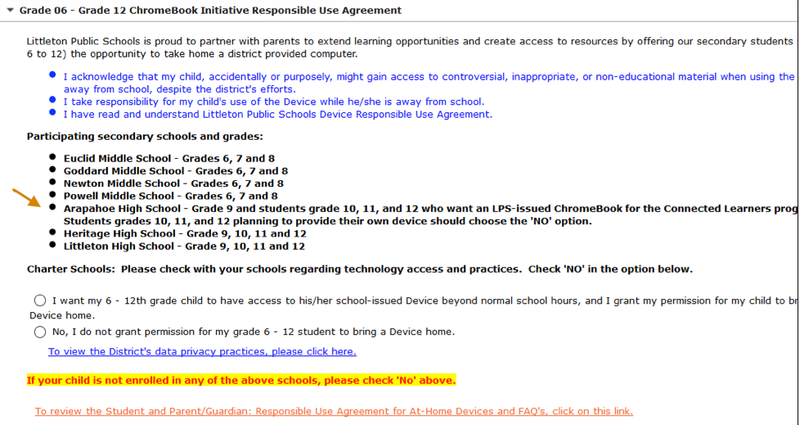 The wording on the Online Registration is designed for the other schools, so note that the first option is to receive a district chromebook, and the second option at AHS is to bring your own device. All incoming 9th graders at AHS will be issued a chromebook (for district testing purposes) no matter what - you should choose the first option ("I want my 6th - 12th grade child ..."). You can still choose to bring your own device on a daily basis if you'd like to and then bring the chromebook on state testing days. All 10th - 12th graders at AHS can either choose to get a district chromebook (in which case choose the first option), or choose to bring their own device (in which case, choose the second option, "No, I do not want..."). For those who do select to use one of our chromebooks, we will have them for you during schedule pick-up.